Christie’s features two different Ref. 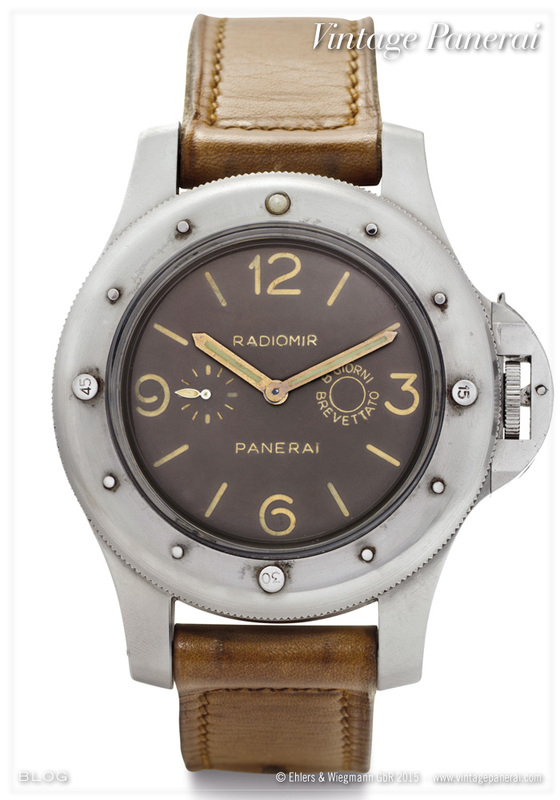 3646 watches an a “40 metri” depth gauge from Guido Panerai & Figlio in their upcoming auction on 16 May 2016 in Geneva (Sale 1413). 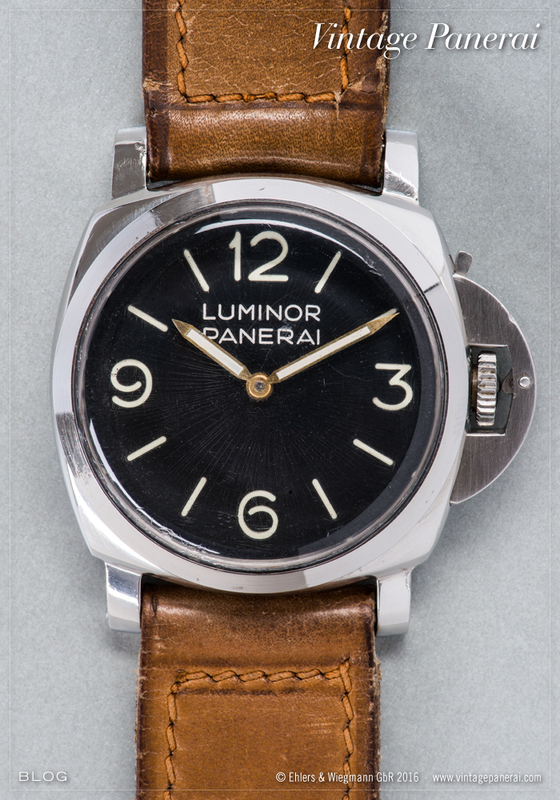 Lot 133: A “Luminor Panerai” depth gauge (case size: 70 x 90 mm) for 40 metres with anti-reflective coating. 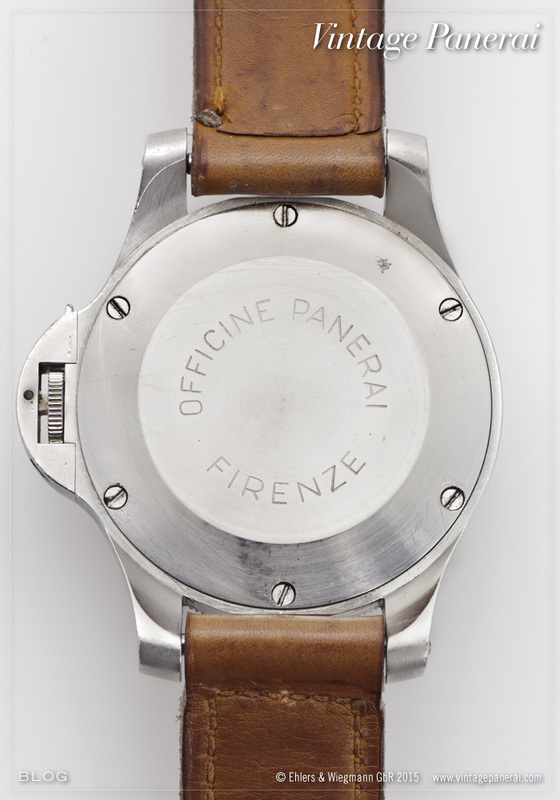 The back of the depth gauge is signed “OFFICINE PANERAI · FIRENZE · BREVETTATO”, the steel GPF buckle, sewn to the strap, is unsigned. The Guido Panerai & Figlio instrument is accompanied by a heavy, stainless steel knife for underwater works, made by Galeazzi (La Spezia). Similar depth gauges in various versions (aimed for proper use in different depths depending on the underwater activities) are featured in our new book “The References” (second volume / 1950’s-1960’s) in chapter XI (page 1314-1367). An identical “40 metri” depth gauge is shown on page 1364-1366. A similar Galeazzi knife with tool grip has been introduced earlier here. 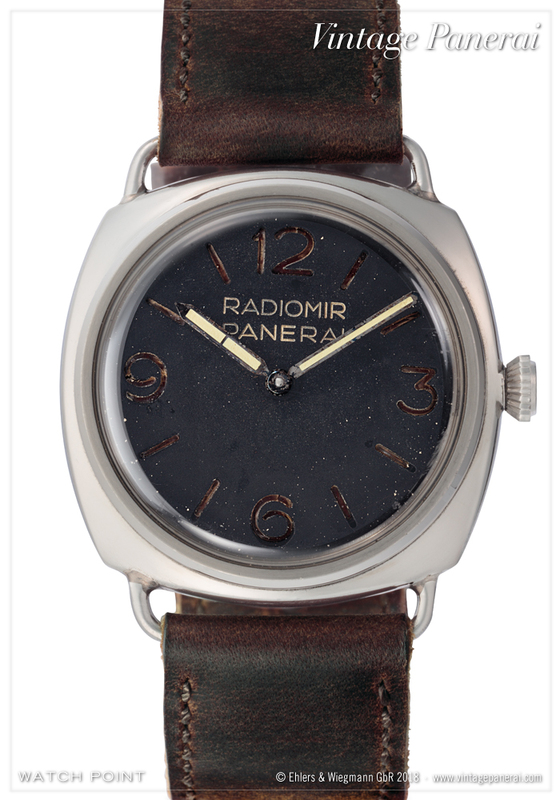 Lot 134: This watch has been added recently in our database. New to the market, representing another typical “Kampfschwimmer” of the Ref. 3646 / Type D number group with anonymous sandwich dial. The inner caseback engravings which bears the Rolex SA stamp, reference and case number, in combination with the Rolex Cal. 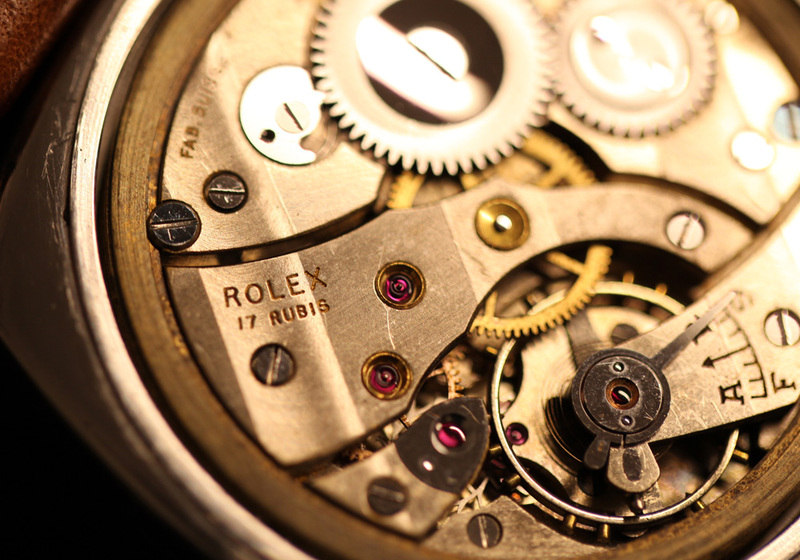 618 / Type 1 movement, are matching our database criteria for watches of the Reference 3646 / Type D number group. Watches of the Ref. 3646 / Type D are featured in our new book “The References” (first volume / 1930’s-1940’s) in chapter II.IV (page 398-531). Lot 135: Again up for auction at Christies, the Ref. 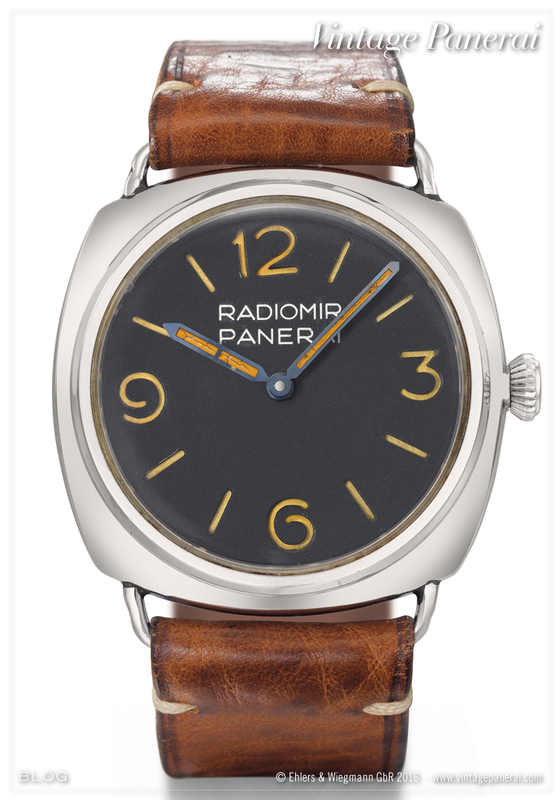 3646 / Type C with “Radiomir Panerai” dial, as introduced in earlier postings from a past auction in November and December 2013. 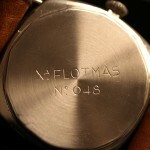 The outer caseback is engraved with a matriculation number of the Italian Decima Flottiglia MAS (short “Xa FLOTMAS No. 048”). Watches of the Ref. 3646 / Type C are featured in our new book “The References” (first volume / 1930’s-1940’s) in chapter II.III (page 248-397). 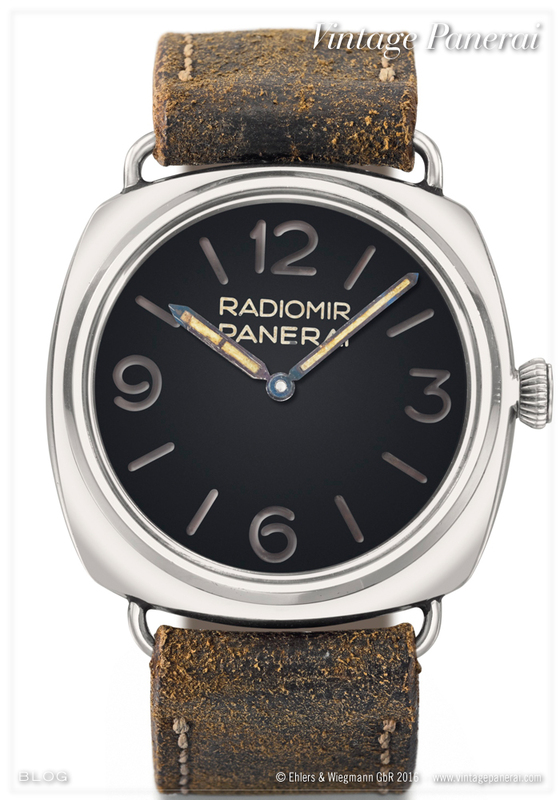 Christie’s New York will have a rare GPF 2/56 “Radiomir Panerai” with Angelus movement (LOT 154), made for the Egyptian Navy, in their upcoming Important Watches auction 3752 (June 17th). This “Egiziano Grosso” bears the matriculation number 012 on the inside of the caseback, which is screwed onto the body by six screws. 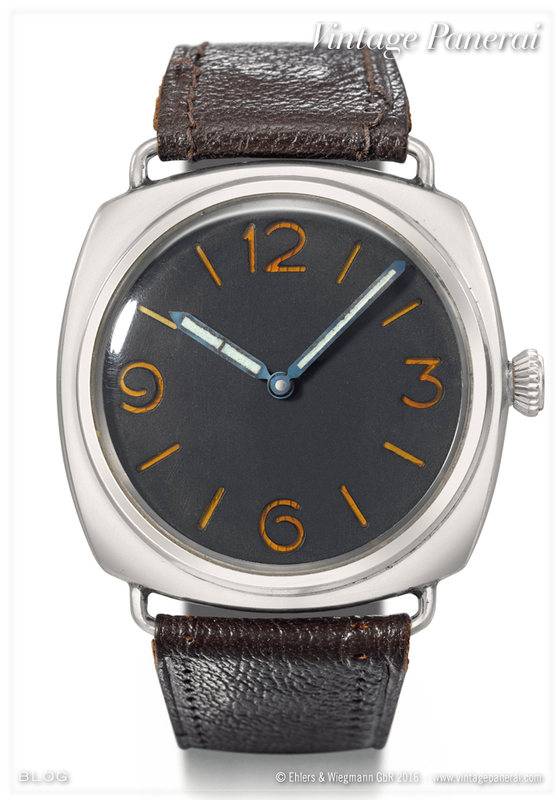 The “engine” of this watch with a case size of 60 mm and rotating bezel, the Angelus Cal. SF 240 eight-days-movement, is signed “12.55” and equipped with an Incabloc shock protection. The Angelus movement can be clearly identified on the face of the huge watch by its small second function with a subdial at 9 o’clock. 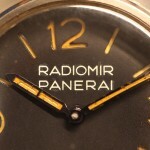 Hour and minute hand are shaped in the “single pencil” style, which is also typical for Vintage Panerai watches with Angelus movement. 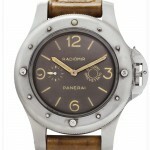 The sandwich dial bears the “8 GIORNI BREVETTATO” symbol on the right side at 3 o’clock. 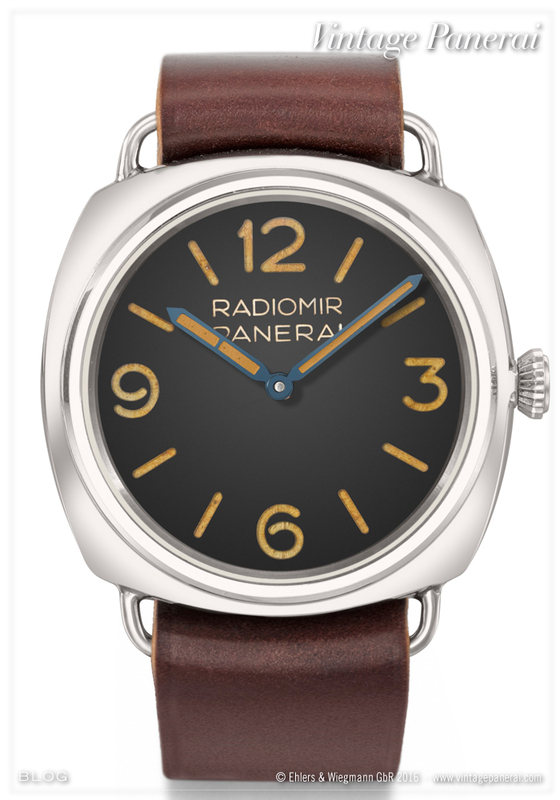 This engraved symbol is an unique feature in the range of Vintage Panerai watches, and can be found only in this particular reference, which was produced for the Egyptian Navy. 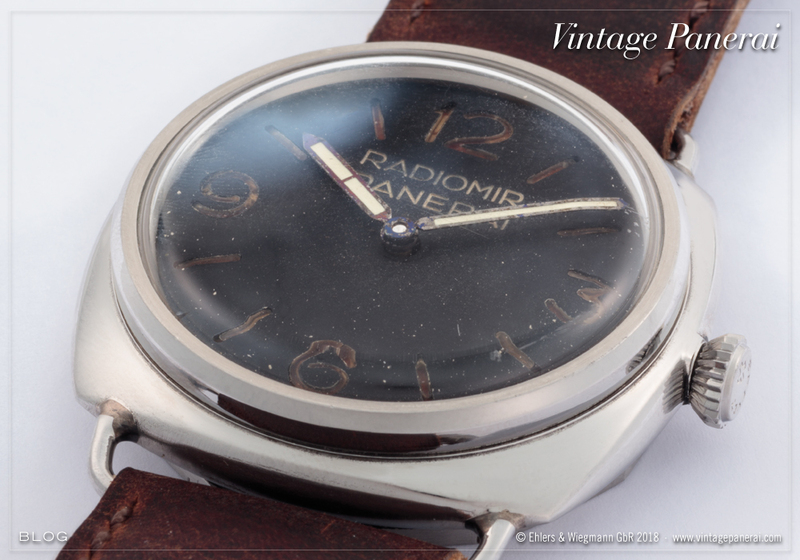 This GPF 2/56 “Radiomir Panerai” is already recorded in our database and has been published in our book “The References” (first edition 2009 / chapter V). Christie’s New York features another rare Ref. 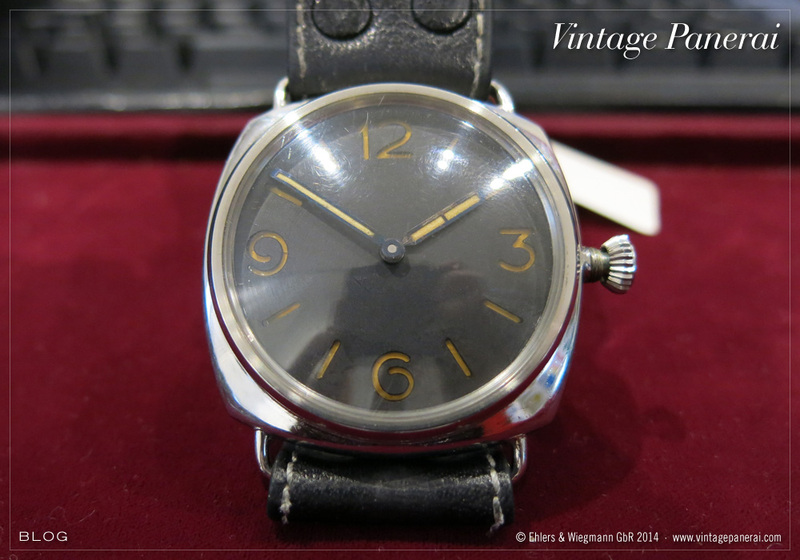 3646 / Type D (LOT 155) in their upcoming Important Watches auction 3752 (June 17th). 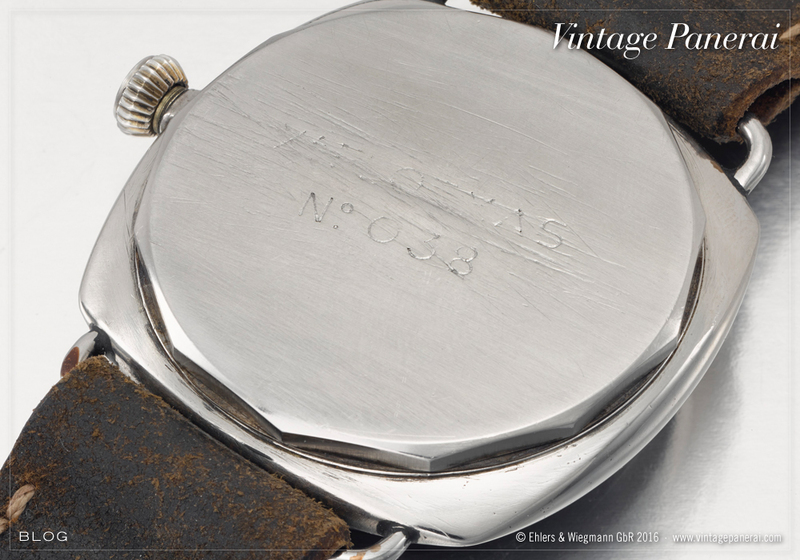 The watch with its anonymous “Kampfschwimmer” dial is recorded in our database since 2013. 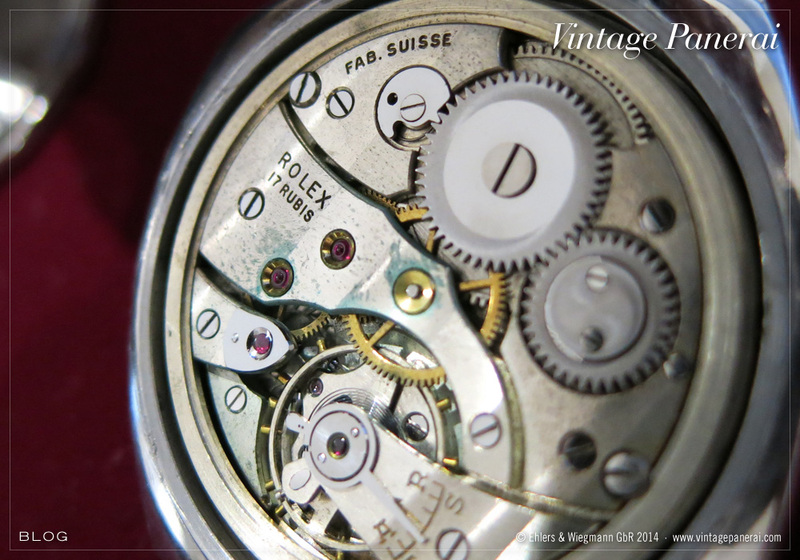 The inner caseback engravings bear the Rolex SA stamp, reference and case number of the watch. In combination with the Rolex Cal. 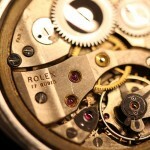 618 / Type 1 movement, these details are matching with our database criteria for watches of the Ref. 3646 / Type D number group. The caseback of the watch bears the additional “Marine Kampf-Schwimmer” (navy frogmen) engraving plus the year of its service (1945). The initials of the watch’s first owner “AM” were engraved in a german POW camp right after the war, where some of the remaining german frogmen units were imprisoned. After the war, many watches “changed ownership” with members of the allied forces and travelled to these servicemen’s home countries (UK, USA…). Like other valuable asset, wrist watches were sometimes traded for other goods, which were urgently needed for life back in these days (“lucky strike currency”). 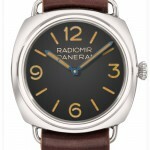 This is why today some of these watches surfaced overseas, as it is the case with this watch. Since the end of the 2nd world war this Ref. 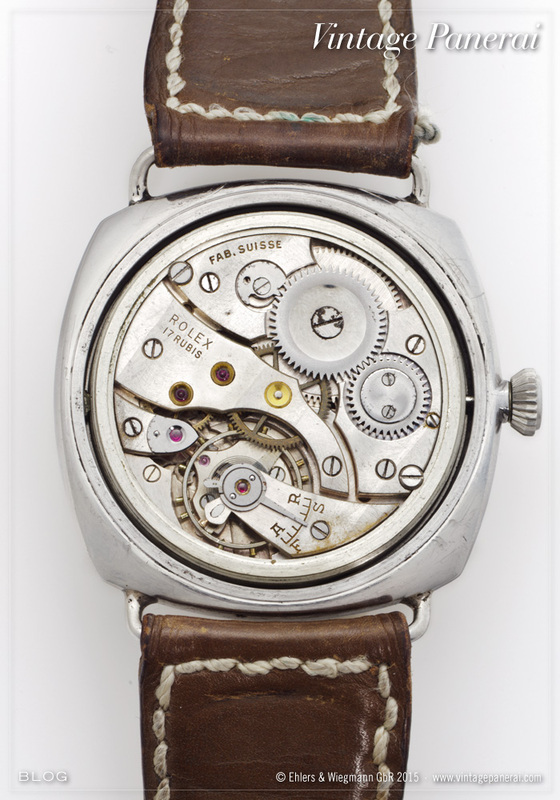 3646 / Type D watch remained in the United States, where the family of the 2nd owner (a former U.S. Navy serviceman) contacted us in 2013 to find out the history behind. Similar watches of the 3646 / Type D number group are featured in our books “History1” (chapter II) and “History2” (chapter V and VII). You can read in these books many details about training and missions in which these Panerai watches were an important part of the frogmen’s equipment during the 2nd world war. 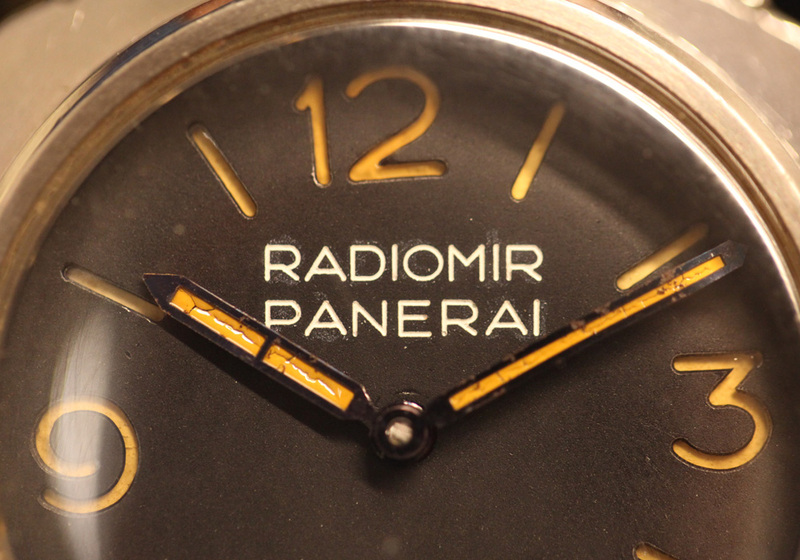 May 2014 will be interesting to follow three important auctions, where Vintage Panerai watches will be up for sale. 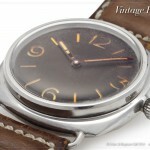 We hope they find a good new home and remail surfaced in the Vintage Panerai collectors world. Dr. Crott (Frankfurt/Germany) starts the auction month on saturday, may 10th. They have an engraved “Kampfschwimmer” Ref. 3646 / Type D in their 89th Auction (LOT 289). 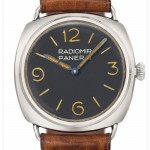 The watch comes with a rare brass dial, corresponding flat bezel, typical Rolex Cal. 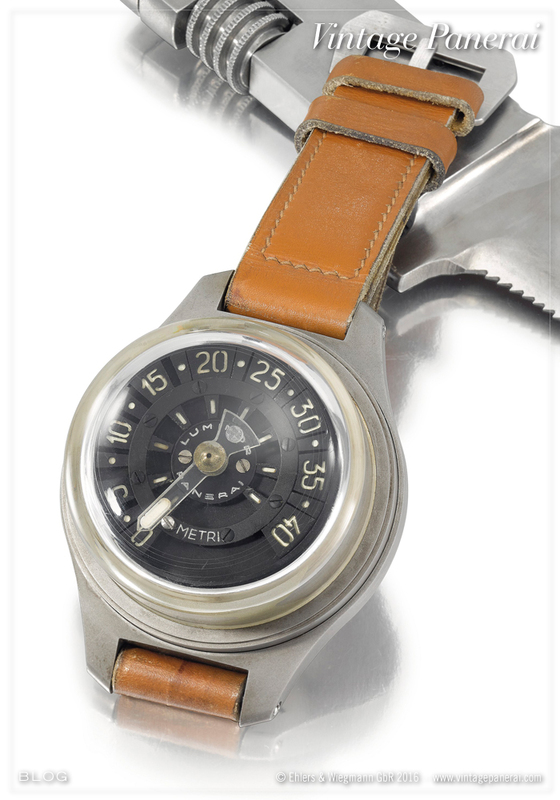 618 / Type 1 movement, leather strap and very rare chromed brass buckle. The caseback of this Vintage Panerai watch is engraved with the initials of the first owner HV surrounded by Marine-Kampfschwimmer 1944. Christie’s (Geneva/Switzerland) has another Ref. 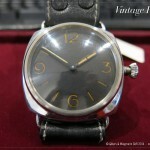 3646 / Type D “Kampfschwimmer” on their Important Watches 1401 for auction (LOT 433) on may 12th. 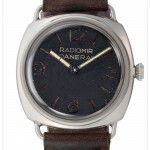 This Vintage Panerai watch comes with anonymous sandwich dial and the typical Rolex Cal. 618 / Type 1 movement (with 17 jewels and without Incabloc). 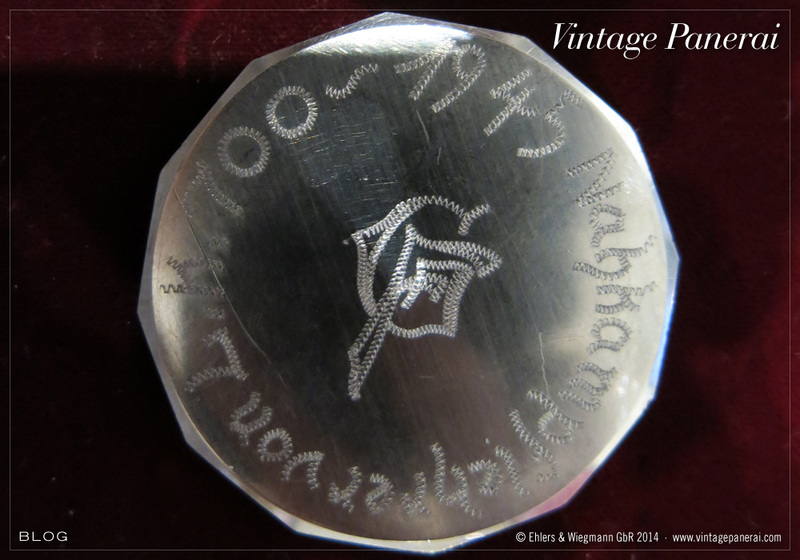 The caseback is engraved with the initials of the first owner GF surrounded by Nahkampflehrer von L.K. 700 1945. Last but not least, Sotheby’s (Geneva/Switzerland) presents a Ref. 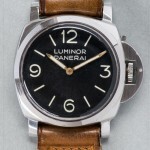 6152/1 “Luminor Panerai” in their Important Watches auction (LOT 298) on may 14th. 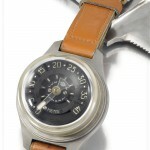 The watch belonged to Admiral Gino Birindelli (M.O.V.M. ), commander of the Com.Sub.In. in the 1950s and SLC pilot veteran from WW2. 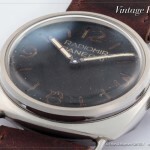 The engine of this Vintage Panerai watch is the typical Rolex Cal. 618 / Type 4 movement (with 17 Jewels and Incabloc). 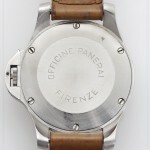 It comes with a rare, rotating plexi bezel of which only a few pieces are existing today. Christie’s has a Ref. 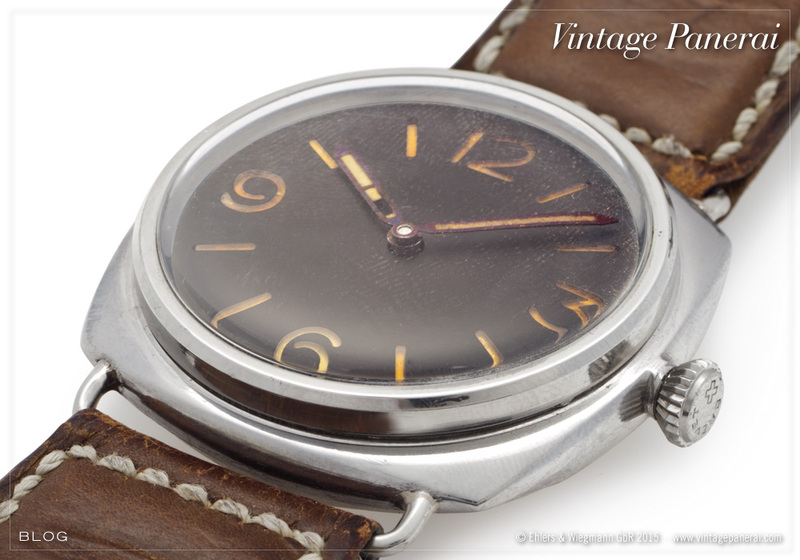 3646 / Type D “Kampfschwimmer” in their Important Watches auction 1401 (LOT 433) on may 12th, 2014. The inner caseback engravings, in combination with the Rolex Cal. 618 / Type 1 movement, are matching our database criteria. Used in Ref. 3646 watches from Type A to Type G, the Rolex Cal. 618 / Type 1 movement comes without Incabloc shock protection. Typical for this non-incabloc version is the serif font for the letters A-R (french) and F-S (english) engraved on the regulation device. The watch comes with an engraved caseback, done in the typical tatooing machine style, which can be found occasionally on similar 3646 watches used by german frogmen. The surrounding text Nahkampflehrer von L.K. 700 (hand-to-hand-fight instructor of Training Commando 700), the first owners’ initials (GF) in the center and the year of service (1945) are giving this watch the grade of being a real tool watch in the 2nd world war. A historic photo of frogmen during hand-to-hand-fight training can be found in our book “History2” (page 460). 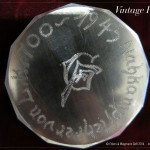 The personal stories of several frogmen of the Lehrkommando 700 (engraved L.K. 700) are described in “History1” as well as in “History2” in several chapters. Additional photos reached us “just in time” before the auction at Christie’s in New York is about to start (December 17th). They have a Ref. 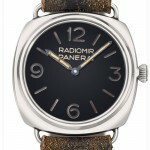 3646 / Type C “Radiomir Panerai” in their Important Watches auction (LOT343). We have published information on this watch also earlier here. The provided photos from Christie’s give us a good impression about the details of the watch: the structure of the sandwich dial, the patina on hands, markers and on the blued steel hands, “grown” in the past years, as well as the stunning decorations of the Rolex Cal. 618 / Type 1 movement with its typical features. The intensive shine of the rubis in the light of the surrounding express a colorful appearance of the Rolex movement inside this Vintage Panerai Ref. 3646 / Type C watch. 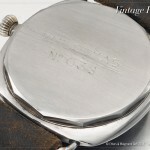 Of course the rare engraving on the caseback is another feature worth to point out: the matriculation number of the italian Decima Flottiglia MAS – short “Xa FLOTMAS No. 048″. 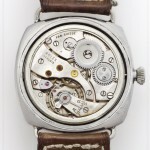 On the inner caseback, the typical engravings of our 3646 / Type C database criteria can be found. 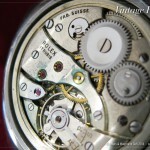 An overview of the different caseback markings in Ref. 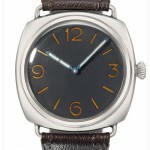 3646 watches can be found here: Type A-C and Type D-G.